Thanks to Zach Graham for sharing his photos (this one from Tokyo). Mark has posted scanned copies of the 7-page "Comic Strip Artist's Kit" created by famous Disney artist Carson Van Osten in 1975. Mark calls it "...probably the best thing I've ever seen about practical staging and drawing for storyboards or comic books." Thanks to the generosity of Mark — and of course, Carson — we can download good copies from the original sketches. This stuff is gold. Another great post with many large visual examples (suitable for printing) is this one entitled "D&D7: Rhythm (part one)" which explores rhythm as it relates to drawing. (See the August archives for more D&D tips). Checkout the 5 Minute Art School: Composition 102. I love the simple insights here on composition, much of which I believe can be applied to photography and slide design, etc. In a post on proportion Mark shows some good examples. "They are a good example of how much you can do with very few elements! Less is more," he says. 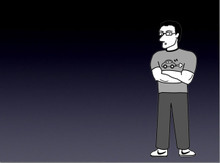 Actually, this young blog is filled with little gems so do not forget to explore the archives. While watching the TBS channel yesterday I stumbled upon a short segment discussing the popularity (on the web) of two short commentaries by Japanese artists. 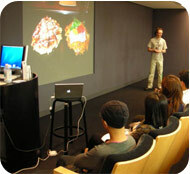 One of them is "Sushi," a great video with lessons for presentation designers. I linked to this in a post back in January. The other is a 30-second animation called "run" (hashire). This simple animation is brilliant and does a good job of "summing up" the life of a so-called "typical salaryman." The power of the simple drawings in the animation is that they allow us to see ourselves in the salaryman's shoes. It's also a good example of McCloud's "amplification through simplification." 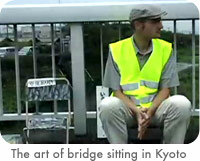 Anyone who has visited Japan or knows anything about Japan and its culture will get a kick out of this clip. 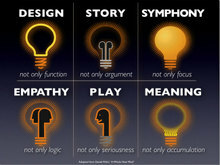 Several months ago I used these slides below as part of a presentation on blogging. 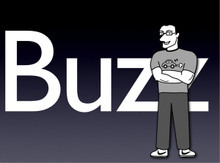 Here I was talking about the idea of "buzz marketing" and building WOM (word of mouth). 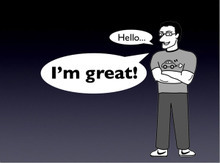 This was the first time I used a "cartoon" character in a visual I think. In this case, the character is a drawing of me made in about 30 seconds in Adobe Illustrator by my artist/designer-turned-PR-pro wife. I could have used a photo of myself, but since I was the one doing the talking, it just seemed weird to have a pic of myself on the large screen behind me. Besides, I am just using myself as a kind of representation of any individual or organization, brand, etc. As you can probably tell, my point was that what I say about me (advertising) is far less important than what other people say about me. That is, I can (1) say I am great, but (2) who would believe that? <Sigh>...a lonely place. On the other hand, if (3) others say good things about me, well, *that* you just might believe. And (4) so-called "buzz-marketing" or WOM is giving people something worth talking about. 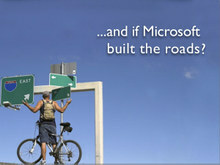 Famous brands like Apple, Starbucks, Harley-Davidson, etc. 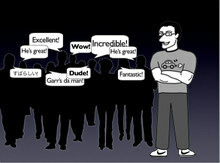 know all about how to generate buzz and word-of-mouth by giving people something worth talking about. Us "little guys" can't spend the millions needed to make advertising begin to (maybe) work, but anyone with a compelling story to tell — a product or a mission worth talking about — can generate buzz and word-of-mouth worth far more than the ephemeral influence of traditional advertising. You know my philosophy: Keep reading and keep looking — we just never know where we'll find inspiration and knowledge if we open our eyes and go off the beaten path. 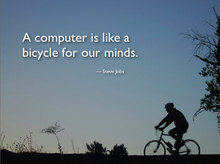 If we embrace the "beginner's mind" and keep our mind "empty" then it's ready to accept anything for examination. It was in this spirit, then, that I purchased a book on (gulp) comics. I first heard of the book from Cliff Atkinson about two years ago. Dan Pink also mentioned the book in A Whole New Mind which I just read a few weeks ago. 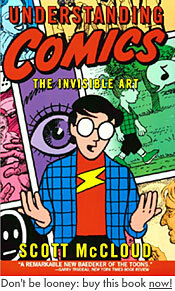 The book is called Understanding Comics: The invisible Art by Scott McCloud. I highly recommend that you get this book. Frankly, you're nuts if you don't add this book to your library. Seriously, stop what you are doing right now and buy this incredible book. I'm serious — do it right now. (I'll wait....) You back? Good. Believe it or not, many of the principles and ideas discussed in this wonderful and highly visual book parallel the art of presentation. Now, comics are not the same as a presentation enhanced by slideware, but if you read McCloud's book with an eye toward presentations or any other form of storytelling and graphic design, you will find many fundamental concepts and techniques that will surely help you think differently about the power of visual communication and the art of combining words and images. This book is not just for fans of comics — not by a long shot. "By stripping down an image to essential 'meaning,' an artist can amplify that meaning..."
McCloud says that "Cartooning is not just a way of drawing, it's a way of seeing! The ability of cartoons to focus our attention on an idea is I think an important part of their special power, both in comics and drawing in general." Specific applications will vary, of course, but we can apply the spirit of "amplification through simplification" to creative disciplines outside the art of comics. A key feature of many comics is their visual simplicity. Yet, as McCloud reminds us, while casting an eye to the wonderful world of Japanese comics, "simple style does not necessitate simple story." Many people (outside of Japan) prejudge comics by their simple lines and forms as being necessarily simplistic and base, perhaps suitable for children and "the lazy," but not something that could possibly have depth and intelligence. Surely such a simple style found in comics can not be illustrating a complex story they say. However, if you visit coffee shops around Tokyo University — Japan's most elite university — you will see stacks and stacks of comics (Manga) on the shelves. There is nothing necessarily "stupid" about the genre of comics in Japan at all, in fact you'll find "brainiacs" in all shapes and sizes reading comics here. Still, most people in, say, the U.S. have a visceral reaction to seeing comics and fail to understand them as anything but "low" art at best. Perhaps this reflects a hole in the education system in the U.S. Perhaps visual literacy needs to be taught along with other fundamentals. In any event, the situation today is that most people have not been exposed to the idea of making an idea or a visual stronger by stripping it down to its essence. Less always equals less in most people's eyes. If we apply this visual illiteracy to the world of presentations, you can imagine the frustration a young "enlightened" professional must feel when her boss looks over her presentation visuals the day before her big presentation and says "No good. Too simple. Good lord! You have not said anything with these slides! Where are your bullet points!? Where's the company logo!? You're wasting space — put some data in there!!!" 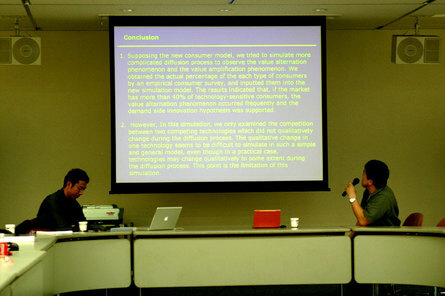 She tries to explain that the slides are not the presentation but that she is the presentation and that the "points" will be coming from her mouth. She tries to explain that the slides contain a delicate balance of text and images designed to play a supportive yet powerful role in helping her amplify her message. She attempts to remind her boss that they also have strong, detailed documentation for the client and that slides and documents are not the same. But her boss will have none of it. The boss is not happy until the "PowerPoint deck" looks like "normal PowerPoints," you know, the kind used by "serious people." "...trust in those aspects of what you have to say that excite you. Trust that they will excite other people. And try to distill for yourself what it is that seems urgent and potent in your topic. Have faith in your own passion for the subject. And if you have none, then consider a change of career. If you can isolate the aspects of your subject which genuinely excite you, then that can be the fulcrum for any number of effective points." "Juxtaposed pictorial and other images in deliberate sequence intended to convey information and/or to produce an aesthetic response in the viewer." It is easy to imagine, with some tweaking, how this could be applied to other storytelling media and presentation contexts as well. We do not have a good definition for "live presentation with slideware" but a killer presentation may indeed contain visuals which are comprised of "juxtaposed pictorial and other images." And many good presentations certainly have elements of sequence designed to "convey information and/or to produce an aesthetic response." 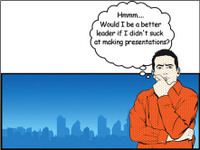 Checkout Wally Woods's 22 Panels That Always Work. 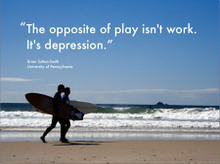 Print this and hang it up near your desk for inspiration and guidance. 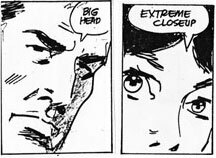 The 22 panels were guides for comics illustrators, but they may also challenge you or inspire you to experiment with the way you display your visual information. For example, an application of "Big Head" and "Extreme Closeup" in my world is to make use of the entire screen and when possible making the slide space seem larger than it is. This effect can be achieved when you "bleed" images off the screen. With the ubiquity of digital still cameras and inexpensive-but-good stock photography there is no reason that one has to keep images tiny on screen. Above. On the left is an actual slide used in one of my recent talks. On the right is the more "usual" way of presenting the text and image together. As I mentioned a couple of weeks ago, I have incorporated Dan Pink's "aptitudes for the conceptual age" in to part of my presentations on presentation design. 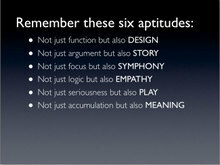 To introduce Pink's aptitudes into my talk visually I first made the slide on the left (below). Yes, I know it's not very "visual" but I thought it would serve to summarize Pink's main points in one frame. Now, my application of the idea of "amplification through simplification" is different than what McCloud was talking about in Comics, but the basic idea is there. In some ways the revised slide on the right is more complex, but from the point of view of its Gestalt, it's more powerful, simple, and easy to grasp quickly. 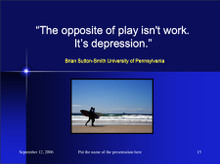 The first bulleted slide has 40 words; revised slide has 24. The revised slide is by no means a work of art or even the best possible graphical representation of the six key aptitudes, but it is far more visually supportive of my verbal message. And it was simple to do. (Left) Yuck. (Right) Not great, but much better. At the end of the book, McCloud gives us some simple, Zen-like wisdom. He's talking about writers, artists, and the art of comics, but this is good advice to live by no matter where our creative talents my lie. "All that's needed," he says, "...is the desire to be heard. The will to learn. And the ability to see." This to me is the essence of his book. 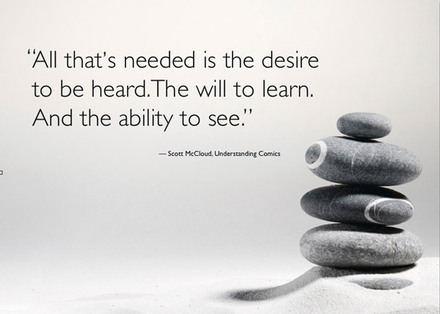 When you get right down to it, it always comes back to desire, the willingness to learn, and the ability to really see. Many of us have the desire, it's the learning and seeing that's the hard part. McCloud says that in order for us to understand comics we need to "...clear our minds of all preconceived notions about comics. Only by starting from scratch can we discover the full range of possibilities comics offer." The same could be said for presentation design. Only by approaching presentations and presentation design with a completely open mind can we see that the options are virtually endless. It is just a matter of seeing. • Scott McCloud's "The Making Comics 50 State Tour"
Steve Irwin: "Passion, enthusiasm push an educational message"
We were all deeply saddened to hear on the news Tuesday night that Steve Irwin was killed in a freak diving accident while filming off the Australian coast. Actually, I was floored when I heard the news. It's just unbelievable. Too sad for words. Our hearts go out to the friends and family of Steve Irwin. I had long admired Steve and his wife Terri (a fellow Oregon native) for the wonderful contributions they've made to wildlife conservation and education. CNN called Steve "a TV presenter" and he was indeed a great presenter and teacher. Steve was a man of action and passion, no question about that. Believe it or not, some people even knocked him for his enthusiasm, but his passion was real. 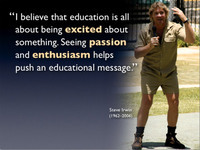 As Steve said, "...passion and enthusiasm helps push the educational message." Steve had plenty of that as well as a sharp mind and amazing courage. The world lost a very great man and a great teacher this week, and much, much too soon. We'll never forget you, Steve. Thanks, mate, for all you've taught us. You will always be an inspiration. One of Steve's fans made a nice little slideshow in tribute. You can see it on YouTube here along other videos related to Steve Irwin.